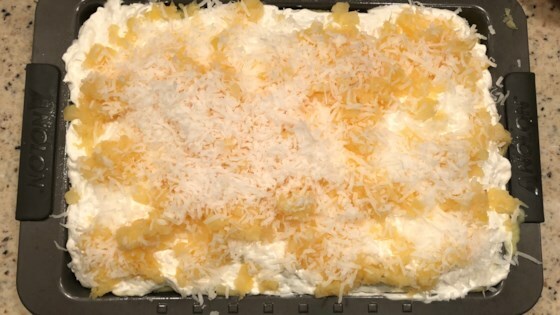 "A layered dessert with cake mix, vanilla pudding, cream cheese, pineapple and coconut. Easy, quick and good! You may top with cherries if you like, or at Easter I use jelly beans and it's a beautiful Easter Cake." I would not recommend this recipe. It tastes okay but it calls for too much pudding and whipped topping. You cannot put all that on a cake. I only used half the amount. Not worth the effort! Best cake I have ever made! I substituted some pineapple juice for some milk in the pudding and layered it between two halves of cake. This recipe was easy and tastes great. I used a simple buttercream frosting with pina colada and rum flavoring. They were a hit! this is really a good cake try it. This cake is excellent as is> I don't understand why people have to completely re-write a recipe. If you don't like it as is instead of changing someone else's recipe submit your own. Loved it. Put cake in large tupperware dish so had lots of room to add pudding & cool whip, etc. I followed everyone else’s reviews and just used one box of vanilla pudding. This was more than enough pudding. This is a good recipe that is easy enough for a six year old to make.